Today, TrueNorth's home office is proud and excited to host our company’s annual State of the Union. This day marks one of the rare occasions when our companies can meet at the Cedar Rapids headquarters to reflect on the success of the past year, share our plans for the current year, and set goals for the future. 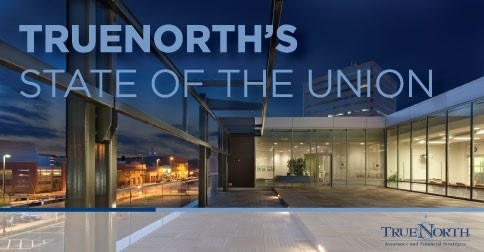 Since TrueNorth's founding in 2001, our company has continued to grow and develop. As of today, the TrueNorth team consists of over 250 professionals in 13 locations, working daily to serve thousands of individuals and business clients nationwide. When we hold company meetings, like the State of the Union, we celebrate the relationships we’ve fostered, identify areas of continued growth, and orient ourselves as we move forward, all the while, anticipating the company’s growth for generations to come. Today, we would like to thank the many communities, businesses, and individuals we work with on a daily basis throughout the country. Your business, guidance, and enthusiasm continues to inspire and guide us as we cultivate our business to meet your needs. As we continue our journey, we invite you to follow along on one or all of our social media sites. Click the following links to follow us on Facebook and LinkedIn.